Thanks to roadetripamerica.com for my biggest chuckle of the week. 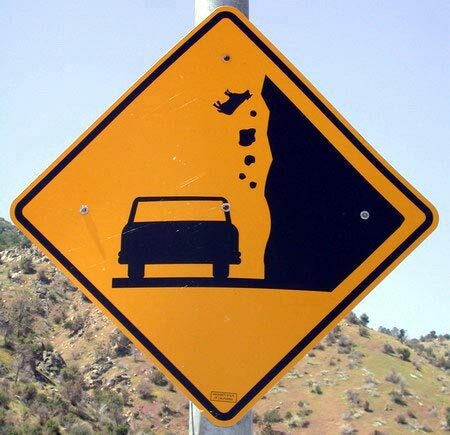 With a little research, I discovered that falling cows can be a driving hazard. A couple from Michigan, celebrating their anniversary with a trip to Washington state, were enjoying a drive along scenic Highway 150, until a 600 pound cow landed on the hood of their car. According to the Wenatechee World, Posted November 05, 2007: MANSON — A cow fell about 200 feet off a cliff Sunday and landed on the hood of a minivan passing by Rocky Point about one mile east of Manson, officials said. 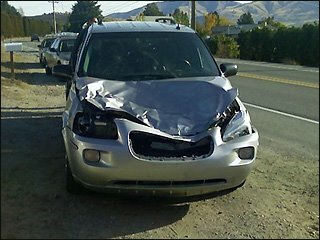 Charles Everson, Jr. and his wife Linda escaped injury. “It was just ‘bam’— you just saw something come down and hit the hood,” Charles Everson said this morning from his hotel room in Manson. Went to visit the Oregon City Municipal Elevator http://en.wikipedia.org/wiki/Oregon_City_Municipal_Elevator on Friday.The Oregon City Municipal Elevator is a 130-foot tall elevator which connects two neighborhoods. It is the only outdoor municipal elevator in the US and one of only four in the world. The current elevator was designed and built in the late 1950’s, hence to “space age” look. The city is basically split in two by a 90 foot cliff. The original elevator was erected in 1915. It replaced a 750 step stairway and was water-powered. After several frustrating years It was converted to electric power in 1924. The elevator is free and there is a helpful operator during the hours it is open, 7am to 7pm. We also walked across the Oregon City bridge http://en.wikipedia.org/wiki/Oregon_City_Bridge It is a great little bridge currently under repair. The bridge was originally built in 1922 replacing a pedestrian suspension bridge.